Schwartzberg also analyzed the ancient history, and eye-opening new clinical evidence, for that most “underground” variety of all: psychedelic magic shrooms, those 200 species containing psilocybin that alter the mind by forging new neural pathways in the brain. For thousands of years magic mushrooms were used in cultures worldwide: from the Ancient Greeks (yes, Plato and Socrates) to the Aztecs. And, in the 1960s, leading medical institutions like Harvard undertook studies indicating magic mushrooms’ serious promise for things like depression and addiction. All of which came to a crashing, counterculture-fearing halt when many countries, like France (1966), the U.S. (1970), and the UK (2005), made them (and other psychedelics) highly illegal drugs, putting the kibosh on this important research for decades. Well, now the research is again on fire, with dozens of studies coming out of top universities like Imperial College-London, NYU, UCLA, the University of Zurich, and Johns Hopkins (with its dedicated Psilocybin Research institute) on magic mushrooms’ too-powerful-to-be-ignored impact on everything from nicotine and alcohol addiction, PTSD, headaches, OCD – and especially depression and anxiety…often with a single dose, and with the positive effects lasting months. As Roland Griffiths, PhD, one of the top U.S. psychopharmacologists and lead psilocybin investigator at Johns Hopkins, put it, “It’s a Rip Van Winkle effect—after three decades of no research, we’re rubbing the sleep from our eyes.” Important research is just ahead: Compass Pathways (with high-profile investors like Peter Thiel, Mike Novogratz and Christian Angermayer) is about to start major clinical trials testing magic mushrooms’ impact on depression in eight European countries in early 2018 – the largest clinical trial of psilocybin ever. 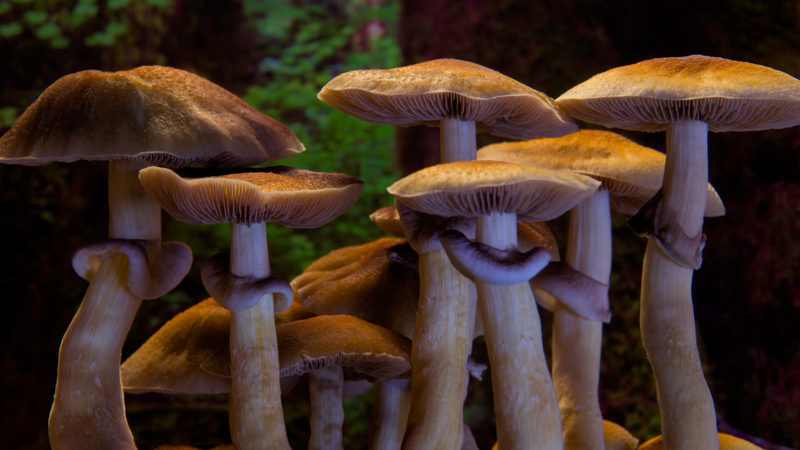 Non-profit Usona is also in the development stages for new studies on psilocybin’s impact on depression and anxiety. So, if Louie Schwartzberg’s opening presentation at the Summit on the unique “magic” that mushrooms deliver to our brains and bodies may have at first seemed far out, it’s anything but. Because the rediscovery and creative uses of mushrooms – in mental wellness, as true superfoods, and in beauty products (and more) – will be a top wellness trend in 2018 and beyond. “Brain resetting” magic mushrooms will start to emerge from underground: more people will microdose them as creativity and brain boosters (a Silicon Valley “start-up” practice now spreading around the world). And, yes, magic mushroom retreats (like MycoMeditations) will keep popping up in places where legal (whether Jamaica or the Netherlands), where the “trip” gets combined with increasingly luxe wellness experiences. And we’ll see movement on the legalization front, making this magic mushroom moment reminiscent of the early days of the cannabis-as-wellness trend. And as medical evidence also ramps up showing that non-magic mushrooms are magical for human health (with adaptogenic, anti-aging and other powers), we’ll see a new world of mushrooms like reishi, chaga, lion’s mane and cordyceps get worked into so many more foods and drinks, from coffee to chocolate – as well as a growing profusion of shrooms in beauty products. And on both the psychedelic and non-psychedelic fronts it’s a trend driven by new medical studies…how welcome in an era with so much “evidence-free” wellness.